La Sénia offers the possibility to run 3 long-distance routes exceeding the 1.600m positive elevation gain. Half 7 Villages will lead us towards diferent charming villages that we can find in Tinença de Benifassà; Volta al Negrell will allow us enjoying the great karstic formations like the Pont Foradat or Mola Aixad’s walls. And finally we have the route named Marató de la Fageda that will lead us to memorable landscapes spreaded across almost 43km long. The route proposed as Half 7 Pobles is halfway between the 7 towns of La Tinença, which runs through the small historical region visiting its small villages. The route has the starting point in the Ulldecona Reservoir in La Pobla de Benifassà. We start the route by track in slight ascent to enter into the massif. After 2 km we left it to begin the ascent on the old road of Portell del Infern. This road was the junction between Fredes and La Sénia. We pass through the Estrets de la Ronyosa, through Solà d’en Brull and we arrive at the Portell del Infern after 7 km of route. Here we can enjoy wide panoramic views of La Tinença with the Tossal de Cervera in front of us and the Tenalla Valley at our feet. In the vaults of Portell we will find a micro reserve of flora with endemic species such as Viola d’Aigua or Gossets de Roca. We continue a hundred meters to leave the main road and begin the descent to the Tenalla, with a sharp descent we will get to the bed of the ravine to break left and continue rising now towards the Fredes path. Before the sharp rise that awaits us we can enjoy the Salt de Robert, an impressive waterfall nestled between rock walls where we can rest for a few moments. Just under 3 km and 360m+ are waiting for you to reach the small village of Fredes, in the middle of a gap surrounded by wild pine forests. Now we are more than 1000m above sea level and we are in one of the most characteristic places of the Massís del Port. Our path follows the GR7 highway path heading to Boixar, where, at 7 km, we reach this town located on a hill, but not before going up to Tossal Gros, the highlight of the route and the perfect watchtower to enjoy stunning views. We will leave the Boixar downhill to face the Devesetes and Font de Montsó path to link with PRCV 75.6 and enjoy a long descent to La Pobla de Benifassà. 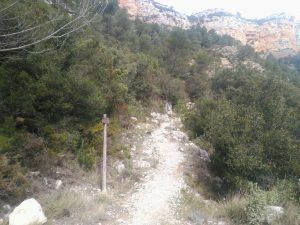 We will leave La Pobla direction Ballestar to follow the Estrets path, high rock walls that we will cross inland to follow the old road that united the interior villages with La Sénia. 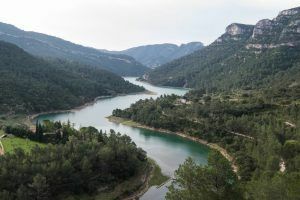 Once you have finished the trail, we will continue along the track until you connect again with the Ulldecona Reservoir path and arrive at the beginning of the route. This 40 km long route can be cut in half and done in two stages. We recommend nightlife at Casa-Refugi el Boixar and follow the route if it is of interest to you. Water: Throughout the route we will only find water in the inhabited villages, there are any other water sources the rest of the route. The proposed tour named La Vuelta al Negrell is unique for the nooks of the Parque Natural dels Ports and the Parque Natural de la Tinença. The route has its starting point at Cueva Ferrins, junction between theTenalla and the ravine la Fou, where we can find a small parking side of the Parque Natural. At the confluence of the two ravines we find a small signpost that guides us towards Pont Foradat. Up to here we follow the Trail touring on the left side of the ravine la Fou almost always uphill. Between spectacular karstic formations we can sight the first goal of the day-route, the Pont Foradat, a geological formation that will leave you flabbergasted. To enter we must continue the marked track by a signpost up to a small climb that will let us access inside it. We will find ourselves right at the limit of the two natural parcs and the two autonomous communities that represents it. We split the route at the intersection in order to continue the path not so milled to surround the Pont Foradat up the north face and continue down the huge walls of the Mola Aixada direction Portella de la Malladeta. Once we find ourselves here, we continue the Parque Natural dels Ports path, the Cova Roja. We take the path uphill to left and pass above a Steel cable a bit aerial but without any difficulty. We’ll surround the Eastern foothills of Mola Aixada in order to start descend the Cova Roja ravine. Early starting the downhill we can divert and see the cave and drink some fresh water at the fountain that spring under its huge walls. The route in descend crosses the Tosques ravine and links with the parth of Cova dels Bous. We will continue always climbing again on the left side of the Fou ravine. In a few kilometres we will get to Cova dels Bous, a great viewpoint of the Morral de Catinell where we can enjoy the geology of this Ports’s small place. The track continues uphill towards Racó dels Cirers, a fully Pyrenean meadow in the middle of the red pine forests, beech and othe bunch of trees. Thereafter we continue a few hundred metres away on the Fou path and we will leave it to continue on the Carrasca Grossa path, where in a few metres we can see this “100 years old tree” and the fresh water fountain that springs at its feets. We continue the same path always uphill direction Casetes de Cap Gros to link it with GR7. This path crosses all Catalonia from north to south and this time we take the south direction. We cross al the superior part of the Capatx ravine, Vallcaneres and below the Negrell top, that we leave in order to ascend to this Ports viewpoint. This is where we reached the top of our route and the almost 19 km route. Next we’ll descend on the track that gives us access to GR7 link to the Font Ferrera shelter, FEEC’s property where we can take a rest or split the route in two and stay overnight. We get out of the shelter leaving GR7 at pour right to further the PR that will leave us at the Mas del Peraire, where the FUNDEM foundation has a reserve of lora and fauna. There it will be no surprise finding great specimens of Cabra Hispánica, emblem of the Ports. Once we leave the farmhouses we take a sharp decline that will take us to the Tenalla ravine. Here we can chose an alternative route if we still have enough strenght, going uphill to Salt del Robert, some 400 metres uphill as many as downhill, through a magnificent path. If we decide continuing the path we only must follow the track on left side to get to the Tenalla forestal home and get in an end at the Cova dels Ferrins. Water: Some sources on the road. The tour starts going out of the village towards the osea of olivet rees for 2.5km crossing the Campo de Tiro and getting to Povet del Torril. We enter by the Camino dels Francesos towards the back part of Pallerols, the path we get to the Valencia Community, at the highest point of Pallerols (la Carrasca), at 831m above the sea level. The rise is on moderate difficulty, although the plain scenery of La Sénia ansd its environment are admirable. From la Carrasca, in order to continue the route, we turn to right to border the mountain and go to Casa de Bernarda, prívate estate and hunting ground of Province of Castellón. At all times duoriung the track we will run high above the dividing line between the Valencia Community and Catalonia. Barely leaving the ruins of Casa de Bernarda on our left, we see an indicator towards the Pi Gros, and that is where we are going to get to the Escaleta. The field is in good condition although part of the path i son loose Stone. The rise up to the Escaleta is on moderate difficulty but its scenery make it simple and comfortable. Once we are at the Escaleta we will go towards Planes de Valldebous, entry of the Ports on the valencian part and arrival on the south-east part of Catalonia. The route is pleasant because of the short gap and the leafy pine trees area up to getting at the Pla, where area is more Stone abounded than vegetation. At this point begins the aventurous part of the route. We start the descent of the Racó del Tabac. Incredible, magnificent, is the feeling that will make us undertake it. We get down about 400m difference in height by a sharp drop path at the beginning and that will get comfortable once we end the first 300m of the 3km long trail. The path is easy and the dificulty always moderated. We get to Tenalla track, which is 615m above the sea level. We barely find ourselves halfway at only 16,40km of this marathon. The way on the path will be very short as we son get the rise up towards Font Roja and Cova dels Bous. We note that we will start a steeply gap and getting at 800m we deviate towards the Cova dels Bous, leaving behind the path of Font Roja. This route is simple and very lush as the dampness makes this path easy to cross. We will continue on the path of la Fou that will get us to Vallcanera. This is quite difficult and along sections we must descend by rocks to cross the Fou ravine or Rafalguerí ravine. Even so, continues to be exciting. It will get us 45 minutes to go up above and we will see the gate of Vallcanera. Crossing we will climb along the path of Retaule. We will keep this way leaving the access way to the Pi Gros on the right until we get to the Vallcanera path, and on to the Pare Faig. On this path we will get to stony soils and making it difficult to get down, due to the erosion that lays down the rocks to slippery slope. In a few km we will get once again to Pla de Valldebous, way to Escaleta, Pallerols and La Sénia. We recommend to take water, as depending on the season, fountains on the route might be dried up.